When art critic Nicolas Bourriaud’s Relational Aesthetics emerged as a loud and disputed theoretical discourse on participation in the late nineties, the art world shuddered; there he was, an art critic attempting to capitalise on the tangible shifts in contemporary practice that displaced materiality for an engagement with the social without paying attention to the historical nexus to which it belonged. In its problematic inquiry, Relational Aesthetics set out to capitalise on the cultural developments incurred by the rise of the internet and the displacement of traditional modes of production. This approach to theorising the construction of a social environment has left a lot of unaddressed tensions, displacing the role the political takes in such an engagement. It seems as if the same attempt has been in made in Hayward Gallery’s new exhibition. Art of Change seeks to capitalise on the ways in which artistic practice, in the context of a consumerist society developing a particular economics and market of production, can reposition itself both socially and politically. In its selection, it looks at the ways in which body and ritual, public and personal collide, and seeks to underline the impermanence of works that attempt a particular form of elusiveness from their own context. Underpinned by an inherent want to connect the political strata that have shaped China’s cultural landmarks from Mao’s revolution until now, the exhibition brings together the work of nine Chinese artists alongside an interactive digital archive navigating a range of landmarks in Chinese cultural history. Curator Stephanie Rosenthal proposes that the recent development of xingwei-zhuanzhi (performance-installation) has come to describe a range of Chinese avant-garde art that resists Western perspectives. That being said, it’s hard not to see wider through lines in recent art history, particularly with works such as Zhan Huan’s 12 Square Meters, in which the artist spreads a liquid made of fish and honey to attract flies in the dilapidated public restroom of the village, sat on the toilet for an hour until his body is fully immersed. Making visible the contrast between the developing high rises and five star hotels that surrounds the dilapidated village, Huan’s work recalls the experiments of Chris Burden or Carolee Sheeman, inhabiting the gallery space as a historical document stripped of politics by the particularity of distance. Historian Meiling Cheng describes this type of performative work as “an increasingly popular genre, which remodels the structure of xingwei (performance) to highlight its sculptural/visual dimension, creating a temporary monument out of an artist’s live action”. [i] Indeed, this objectification of the encounter transforms an engagement into an aesthetic strategy, seeking to intervene rather than subvert. From artists attempting to critique to others engaging with the modes of production in China, the exhibition is an attempt to circumnavigate Chinese art history without its direct Western influences, focusing on the ways in which the performative dissipates boundaries between artistic and social practice, without engaging with the problematic ideological remit of some of the works. 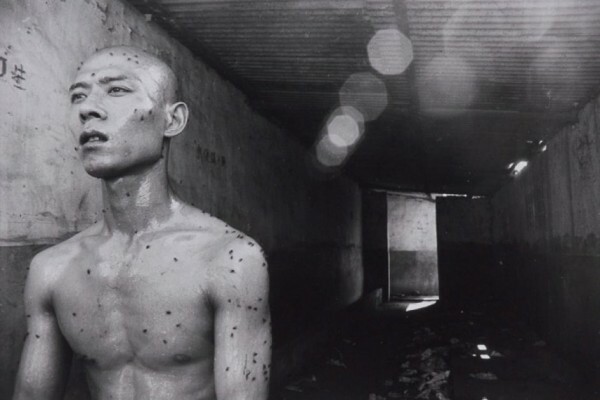 By its very nature, it’s an potent engagement with a particular narrative in Chinese contemporary art without it becoming a fetish to a global audience, yet at the same time, stripped of the immediate context that has shaped it, the art itself feels bare and exposed, an artefact rather than the encounter that seeks to constantly renew and transform itself. There’s a convoluted engagement with a certain artistic economy that circumnavigates issues surrounding labor, dissent, social fragmentation and censorship across material, textual and performative practices; there’s also an emphasis on the ways in which aesthetic strategies and constructed spaces serve as sites of dissent, and the ways in which an escape from traditional, fixed material practices displace political identity. On the one hand, this means most of the installations and works presents in the gallery space engage with change in a literal way- from Liang Shaoji’s Listening to the Silkworm/Nature Series, in which visitors can hear and watch silkworms in the process of metamorphosis in the confines of an intimate space, to Yingmei Duan’s Sleeping, In Between in which the artist becomes a body on a shelf, performing action without action- but that their form and process do not appropriate dominant artistic politics. In this context, Art of Change is an exercise in mapping, in which a constellation of practices is recontextualised by the gallery space in light of a brief engagement with social and political history. Within this remit, the exhibition presents a range of documents and installations that engage with issues of identity, freedom and representation. Madein Company’s breeze blocks fill the volume of the first gallery as objects of protest, followed by a humorous take on global behavioural rituals which are turned into a cultural fitness exercise. Standing like an echoless memorials to a distant protest, these documents and artefacts seem unconvincing, trapped in a process of reanimation diluted by the presupposed neutrality of the gallery space. Elsewhere, Sun Yuan & Peng Yu’s interventions examine the ways in which the natural and the artificial interact, challenging presupposed ethical codes of social engagement. Filling an entire gallery space, their works, ranging from carcasses, specimens and the eponymous Civilization Pillar constructed out of human fat siphoned off during liposuction, to their video work, in which dogs are chained to running machines and position face to face, seem like dissipated artefacts removed from the immediacy of their context. Folklore and ancient ritual can also be found in a range of works, in particular Yingmei Duan’s Happy Yingmei , in which visitor enter an atmospheric forest space through a small door, only to be greeted by Duan herself, handing out questions and wishes to be enacted. Exploring the meeting place between mind and body, Happy Yingmei is an evocative, if incomplete gesture. Profound in its philosophy yet derailed by the gallery space itself, the encounter becomes objectified in situ not only by the label that marks this entrance, but by the particular containment of these thoughts. 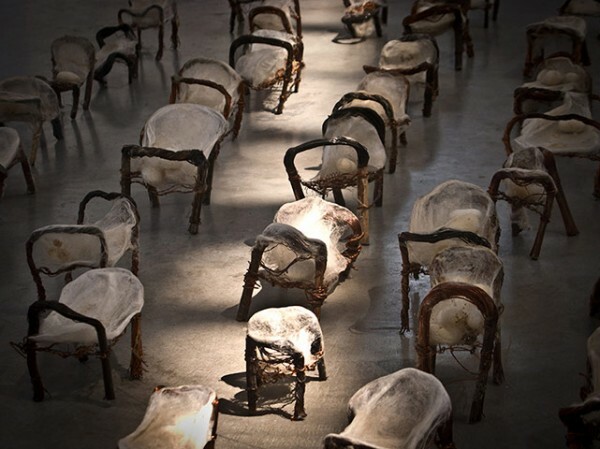 Chen Zhen’s work Purification Room uses natural materials to purify objects, searching for an embodied spirit in an installation which, despite the precision of its objects, feels frozen in time. The lyricism that connects the work of Zhen, Duan or Shaoji brings into focus the ways in which ancient art and craft has shaped contemporary practice, displacing rigidity in favor of ephemerality. What Art of Change manages to do successfully is provide a particular mapping of a range of Chinese art without imposing a narrative of dissidence; that being said, in its theoretical guise, the exhibition assumes an empowerment provided by this spectatorship, underlining the transformative and impermanent nature of these works, which doesn’t quite materialise. Taking inspiration from Taoism, the philosophy that places transformation at the centre of reality, presented as a constant process of change, the exhibition seeks to find a reverberation of this Eastern philosophy across works whose hypothesis takes on a range of conflicting political or social premises for a Western audience. In an article for The Guardian, Ai WeiWei responded to the exhibition by comparing it to a restaurant in Chinatown that “sells all the standard dishes […]; people will eat it and say it is Chinese, but it is simply a consumerist offering, providing little in the way of a genuine experience of life in China today”. By questioning the notion of the independence of Chinese art, Weiwei questions the efficacy of exporting such work outside of an understanding of the intricacies of its context. Yet Art of Change engages with its subject in a more complex way; it brings a range of cultural practice together without disputing their effectiveness as political tools of subversion. It’s an exhibition that presents objects of protest, domesticated global rituals, isolated artistic labor and boxed-in spiritual transformation. It invariably travels a contemporary political text without speaking the language, yet in its failure of representation, it illicits an overwhelming amount of important and interesting questions about the production of contemporary art, its extradition and the domain of the gallery. [i] “Art of Change” by Stephanie Rosenthal, Art of Change: New Directions from China, London: Hayward Publishing, 2012. Print.